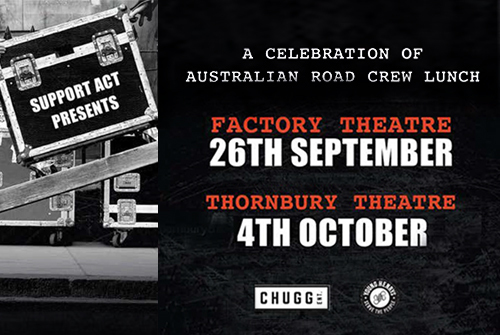 To coincide with the publication of Roadies – The Secret History of Australian Rock‘n’Roll by Stuart Coupe, Chugg Entertainment & Support Act are pleased to announce two special lunchtime events at The Factory, Sydney (Wednesday, 26 September 2018) and Thornbury Theatre, Melbourne (Thursday, 4 October 2018). During the lunches, Stuart will sit down with legends of the Australian road crew world; Nicky Campbell and Ross Ferguson in Sydney and Howard Freeman and Geoff Lloyd in Melbourne to recall various tales of life on the road. The world’s first female roadie, Tana Douglas, is flying in from Los Angeles to speak on both panels. All are featured in Stuart’s book, which covers 60 years of Australian music, commencing in 1957. The lunches will run from 12:00pm until 2:30pm and will include acoustic performances in Sydney from Richard Clapton & Dave Faulkner and Brad Shepherd from Hoodoo Gurus. Phil Manning will be performing in Melbourne with more artists to be announced. All attendees will receive a signed copy of the book with net proceeds to benefit the Support Act Roadies Fund, which is administered in association with ARCA – The Australian Road Crew Association. Stuart Coupe is an author, journalist, music commentator, independent artist, publicist, and radio broadcaster who has been involved with music all his life. Amongst the books he has written, edited or collaborated on are The New Music (1980), The New Rock’n’Roll (1983), The Promoters (2003) and Gudinski (2015).